I actually made this a few months ago, but I forgot to save the pattern, and it took me this long to find it again! I should have looked on Make: Craft sooner– I love that blog. 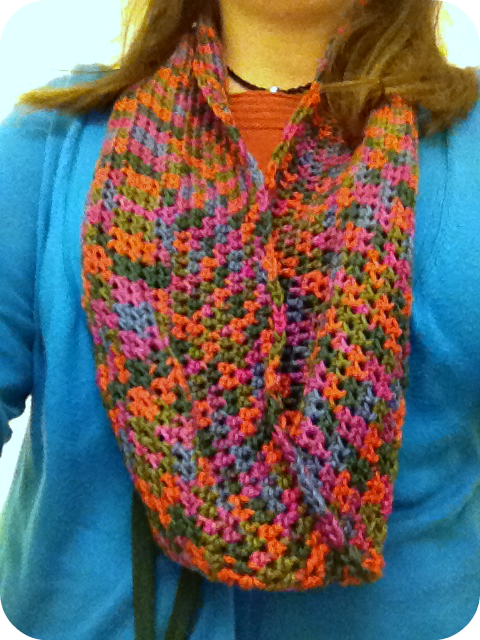 This was a quick, easy and fun pattern to work up, and a nice use for some yarn I had bought off a clearance rack. It was actually an accident I was wearing matching colors in the picture above–I took that picture as soon as I finished the project, and it just happened to be a good outfit for the cowl. Pink was wonderful last night. The show was so much fun. I loved the circus theme and the acrobatics, and of course her voice is amazing. I am so lucky to have good friends who are good to me!